The Dove's Corner: "Phool, ..Mogra Phool "
Just as there are some friends and beautiful people in our lives who never disappoint , always find time for us and keep spreading their fragrance,…so is the very friendly , beautiful and ever so sweet -smelling …mogra plant with its lovely flowers. I have always had a connection with Mogra right from my childhood days when I used to have a fancy for buying small garlands made of mogra from a hawker who used to cycle down every evening in our colony during summer ….. I can never forget the familiar voice of that boy shouting “Phool , mogra phool “…and me borrowing few coins from Mom and running down to buy 1 or 2…at 50 paise each. I loved to keep them in water for at least a day till they had some life… I think this started when I was some 8-9 years old , and continued for quite many years till we actually shifted out of that locality to another house… and I were well into my teens by then…. 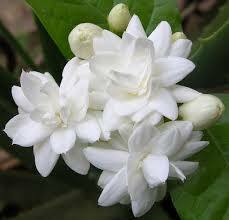 The unforgettable fragrance has ever since been one of the highlights of my summer evenings .